Products and Special Offers: Receive mailings from qualified businesses or organizations from time to time about relevant, special offers based on your member profile preferences. "FDA GLP and CAP regulations for integrating good laboratory practices"
In order to enhance patient safety and improve the quality of testing performed in laboratories, there is a need for integrating good laboratory practices. There are many areas and processes that a laboratory should consider before adding waived testing to the panel of services. Incorporating FDA GLP capabilities into CAP/clinical facility poses certain challenges. Starting a FDA GLP compliant facility from scratch or bringing FDA GLP compliant capabilities into a facility that is already established under a different set of regulations or practices is challenging. So what are the common challenges in implementing regulations for good laboratory practices and how can they be overcome? Read this whitepaper to know about the common queries on more advanced topics related to integrating good laboratory practice. How can we incorporate CAP and FDA GLP compliant testing in the same space? What are the models used by a facility for incorporating FDA GLP capabilities into its CAP / clinical facility? What are the activities associated with good laboratory practices? 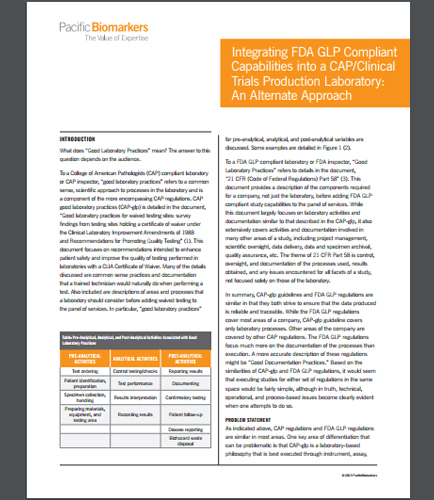 Download this whitepaper now to learn more about FDA GLP and CAP regulations for integrating good laboratory practices in your clinical facility. Preanalytical considerations in the design of clinical trials and epidemiologic studies are the cornerstones of the biochemical analyses. The main subject of clinical study design and epidemiology research is to monitor health, detect the harmful side effects and study the impact of therapeutic interventions. However, the largest contribution of errors in the clinical study design and epidemiology is associated with preanalytical phase. Do you think preanalytical variables are given sufficient consideration when designing clinical trials or epidemiologic studies? What strategies can be used to minimize preanalytical variables in clinical trials or epidemiologic studies? Is there a technology or a process to improve stability of sample analytes so that future investigations will not suffer from poor sample quality? What are the common challenges encountered during the preanalytical phase? This whitepaper discusses the factors to be considered during clinical trial designing and challenges faced during preanalytical phase such as: Availability of limited resources during the clinical designing. Technology and storage processes used to store the biomarker samples. Time elapsed between the sample collection and the stabilizing agents used to store the samples. Download this whitepaper with a brief insight into the issues of preanalytical variables and how they impact the clinical trial design and epidemiologic studies. Testing for incretins, and other gut hormones, presents numerous challenges because of their instability. Therefore, proper sample collection and meticulous pre-analytical and analytical sample handling are crucial for successful quantification of these biomarkers. Incretins, which are insulinotropic gastrointestinal hormones, are produced mainly in K and L cells of the small intestine under the influence of nutritional stimuli. This insightful whitepaper sees into queries like: What are the significant challenges in the measurement of incretins and gut hormones? What is the best practice for minimizing pre-analytical variability associated with blood collection, processing and storage? What are the additional pre-analytical steps that should be considered when samples are obtained for quantification of active acylated ghrelin? Download this whitepaper that provides insights about the challenges, best practices and major concerns regarding commercial assays for reliable quantification of incretins and gut hormones and specific pre-analytical and analytical processes as well as data analysis to improve sensitivity. What is Healthcare analytics ? Healthcare analytics is the analysis of healthcare activities and data collected from different area of healthcare. Analytics help healthcare organizations to co-ordinate better and improve patient wellness. The main benefit of using healthcare analytics is to help you in decision making, which will increase patient experience and outcomes in a cost effective manner. Healthcare is the process to improve health of a being via the diagnosis, treatment, and prevention of disease, illness, injury, and other physical and mental impairments. In other words Health care is an organised system of medical care concerned with the maintenance of the health of the whole body. What is Testing Strategy ? Testing strategy refers to a set of guidelines that aid the test design and regulates the process of testing and how it should be done. The chief components of the testing strategy are objectives and scope, documentation formats, team reporting structure, test processes, client communication strategy and so on. It narrates the general approach put forward in the process of testing. The steps of the testing strategy aids to inform the project managers, developers, and testers about the main issues faced during the testing process. The testing strategy is the chief component of software testing efficiency.